WSU Women’s Rugby Team take the DII National Title! The clock has run out and the tries have been counted and WSU Women’s Rugby is once again at the top of the heap! 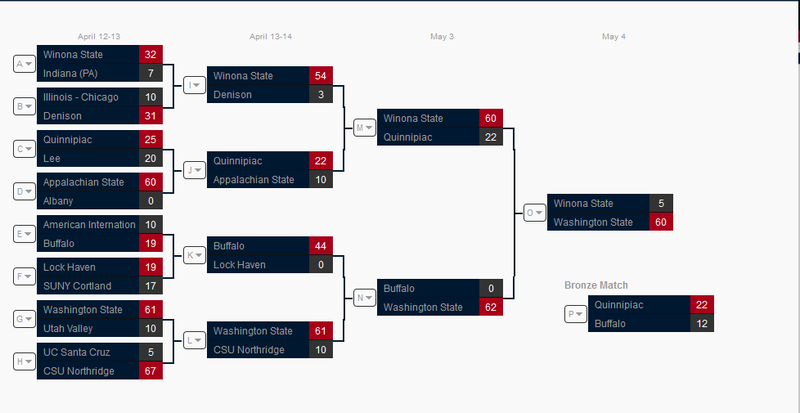 With large spreads over Winona and and Winona State and a complete shut out of Buffalo, WSU secured the National Title. This is the second title for WSU and 4th Final Four showing for WSU in 5 years. WSU placed 3rd in 2009, 1st in 2010, 3rd in 2012, and 1st in 2013. An impressive post season showing for any team especially a team who was reactivated in 2006 after a multi-year hiatus. For more information on the DII quest for Nationals check out the USA Rugby Website and check out the game here. Congratulations on your hard earned win WSU!